You know how everyone seems to have a story about that one valuable comic that they got for practically nothing? Well, this is my version of that story. Let me take you all the back to the year 2003. Or was it 2004? I can't remember. I had just started getting back into collecting comics after a small hiatus. I kinda lost interest in them in the mid to late 90's like a few other people I know did, and I found other hobbies, like skateboarding, that took up a lot of my time and money, so comic collecting had to take a back seat. Once I got older, and my body started to feel all of the falls, bruises, and broken bones, I thought I'd get back into collecting again. It's much easier on my body. I was looking to build up my collection with a lot of new comics. I was naive and thought in order to have a good comic collection, you needed to have a huge collection, so I started buying comic lots on eBay. After buying a long box here, and a couple more long boxes there, my collection started to get quite large. One of the long boxes I bought, I got for practically nothing. I think the total, including shipping, was only about $50, if not cheaper. The box consisted of mostly X-Men titles. There were a lot of Cable comics and a few Deadpool's stuffed in there as well. Somewhere in the middle of them all, was a copy of Uncanny X-Men #297. I didn't think anything of it at the time. 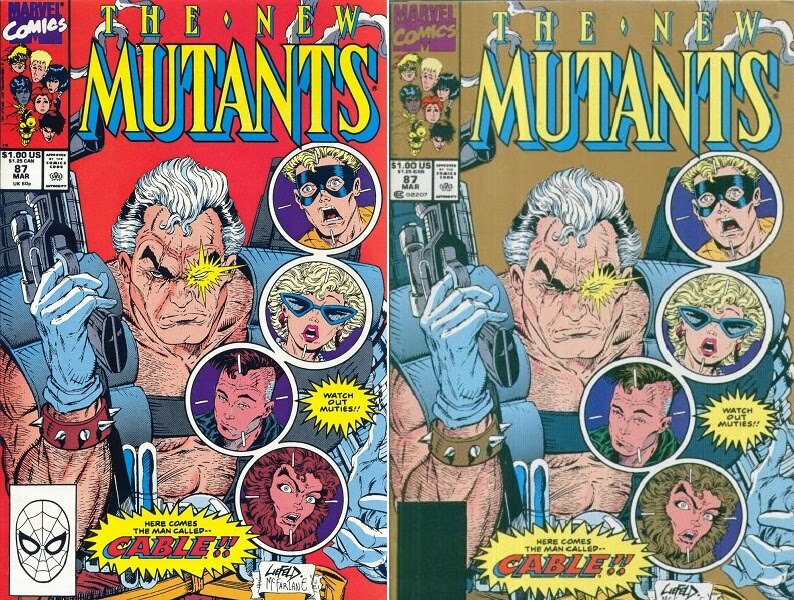 As a lot of you might remember from collecting comics in the 80's and 90's, many of them that had a variant cover with a gold logo or background usually meant it was a second print, like the second print of New Mutants #87, as seen to the right. 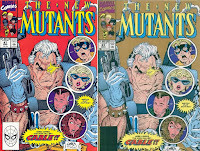 So I shoved the copy of X-Men back into the box, and there it sat for years. It wasn't until about a year ago that I found out that this comic had any kind of value at all. 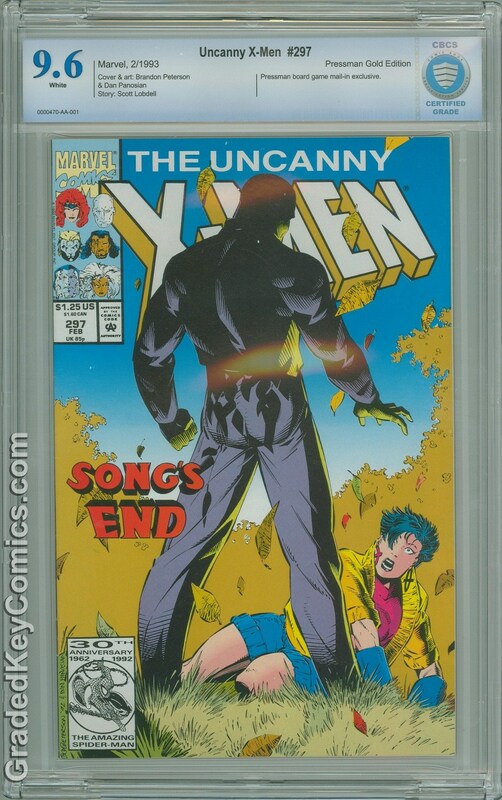 As I was looking at the price guide on ComicBookRealm, I noticed that this "second print" of Uncanny X-Men had seen a significant rise in value. I thought to myself, "why the hell is this comic all of a sudden worth so much? ", so I did a little research. There wasn't a lot of information on it at the time. The only place I found anything was on RecalledComics. It seems that this comic wasn't a second print at all. 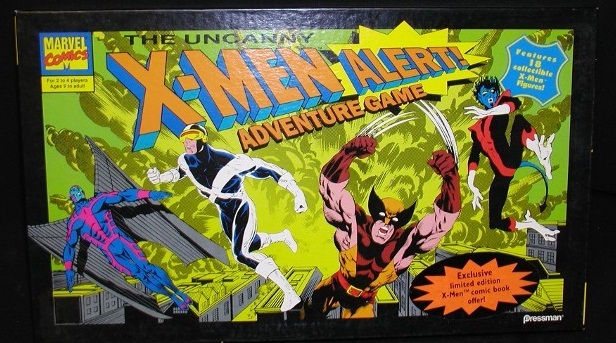 It was actually a variant that Pressman Games used to promote one of their X-Men related board games, and was produced in very limited numbers. 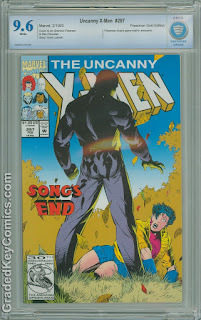 It's estimated that there are only 500 copies of the Pressman edition of Uncanny X-Men #297. Anyway, after I learned what this comic was all about, I decided to send it in to be graded. CBCS was just about to open their doors for business, so after a month or two, I sent it in, mostly to have my comic graded, but also to try out the new company. There were a couple of very small problems with them that I chalked up to growing pains, but in the end, everything was fixed and I got my comic. What else could I ask for? So that's my story of how I found treasure buried in a box of trash. It took a while to find it, and realize what I actually had, but now it's become one of the more valuable comics in my collection. I like this story a lot. Never get tired of it and goes to show just how much one never knows what comic they have in their collection could become valuable. Although, I do have to admit that most from my old collection from back in the day aren't worth much now, but one day it could happen. Is that Pressman still the most valuable out of the ones from the X-Men game? This is the most valuable comic from the game. The other Pressman comics have higher print runs of around 1,000 copies, and aren't quite as sought out as Uncanny X-Men #297, but they are still quite valuable in high grades. Still pretty rare even for the other Pressman variants. Yes it is. I wouldn't throw it away if it was given to me or if I got it cheap. I don't think I'd pay the prices that they are asking for now though.